This month’s question-and-answer session is with Michael Patterson, owner of Pest Pro Solutions, Shelbina, Mo. The 26-year-old has an unusual tale of acquiring his company — and an even more unusual success rate, having completed an industry acquisition within 12 months of taking over the business. 1. How did you get your start in pest control? About five years ago, I started working part-time over the summer at Pest Pro Solutions while attending college full time. My dad helped start Pest Pro Solutions in 2005, but as a full-time veterinarian, his practice takes up most of his time. I trained under, and worked alongside, Pest Pro Solutions’ co-owner, Lynn Riley. After I graduated from the University of Missouri-Columbia with a degree in plant science/crop management, with a focus on entomology, I moved back to Shelbina and began working full-time with Pest Pro Solutions. By September 2018, Lynn and I had discussed the future of Pest Pro Solutions — leading to his gradual retirement and my purchase of Pest Pro Solutions. 2. 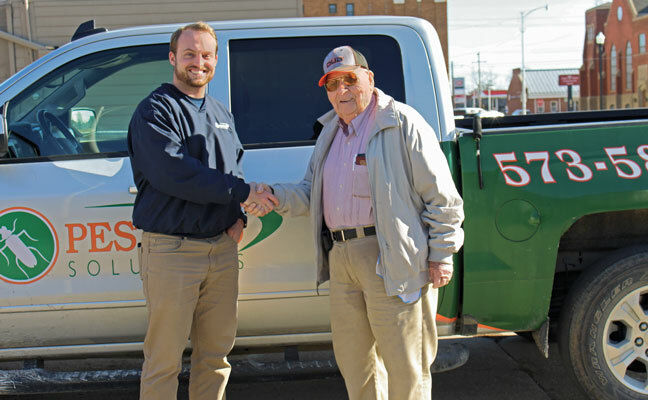 In January, you acquired Hayes Pest Control, Moberly, Mo., from 92-year-old D.P. “Dub” Hayes. How did that come about? I met Dub through our mutual pesticide supplier, Harry Connoyer, Harry’s Consulting & Pest Supplies, in September 2018. Dub and I hit it off immediately. I spoke with Dub numerous times, seeking advice on pest control jobs. In November 2018, Dub asked me if I would be interested in purchasing his company. We closed the acquisition on Jan. 3, 2019. 3. Why do you think he moved on the sale so quickly after meeting you? Dub had multiple companies in the past approach him about buying his company, but after working with him and telling him my vision for Pest Pro Solutions and Hayes Pest Control, we realized we had the same vision for both companies. Dub has a deep passion and caring for his customers. When we started talking about the buyout, he wanted to make sure his customers were going to be totally cared for, the way he cared for them the past 60 years. I am up to this challenge, and I think that is why we meshed so well. 4. Your company is growing rapidly. What is your strategy? With Pest Pro Solutions, our first big step was trying to get our name out there and expand on our current services. I didn’t want to bite off more than I could chew, so we stuck with the basics. I unofficially took over in mid-July, and by word-of-mouth and rebranding ourselves, Lynn and I grew the business in 2018 by 12 percent over 2017. We built a company website. We purchased two trucks and had them wrapped with new logos; previously, we only had one van with a logo on the door. We implemented a continuing education program for myself and our four technicians. Hayes Pest Control is about 43 miles away from Shelbina. With this new location, we have been able to start a termite division for inspections and treatment. Even though it’s new, having a termite division already has helped us tremendously — getting our name out there to Realtors and expanding into new markets. 5. Even in retirement, Lynn helps out at Pest Pro Solutions as needed and is your mentor. Is Dub still active in the business, too? After six decades in pest control, Dub is still going strong! He has been a huge help in the transition — not necessarily with the day-to-day operations, but overseeing what I am doing. He offers advice and input on jobs and how he did things in the past. He doesn’t want me to make the same mistakes he did, and I am grateful to both Dub and Lynn for sharing their experience and wisdom.